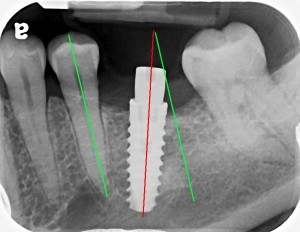 The green line shows the proper position of the implant and the red line shows it off angle. It is readily apparent that the implant for this patient was inserted without the surgeon using a surgical stent. 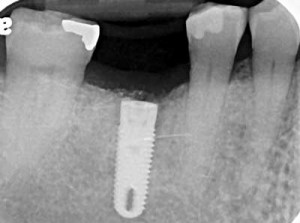 This created failure of the restoration, even though the implant, itself, is well integrated to the bone. The surgical stent is a guide having a replica of the shape and position of the crown or bridge that is being restored and, therefore, guides the angle of the drill, when preparing the site to receive the implant. It should be used with the placement of every implant to provide for the best restoration. The implant shown here was a surgical success and a restorative failure, and, therefore, has to be removed. The abutment and crown that had been placed fell out within six months of its restoration, because it was impossible to properly fit an anatomically correct abutment. The implant was severely angled towards to the tooth behind it and towards the cheek. In addition, it was not placed low enough in the bone, which further complicated creating the right abutment to hold the crown. As a result of these problems, the tooth behind it had to be filed in order to make room for the crown to be seated over the abutment, but, at the same time, the patient had a gap between the crown and the tooth in front of it. She was constantly wedging food between the crown and that tooth. 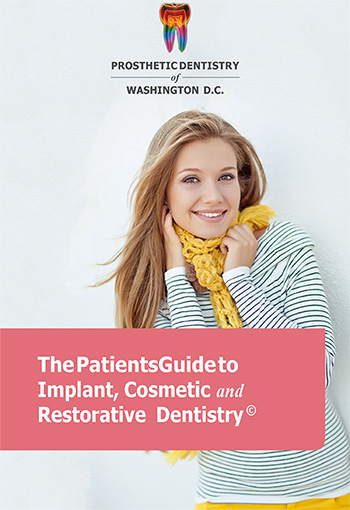 As a result of the poor implant placement, this implant cannot be properly restored, will, therefore, have to be removed and replaced with one that is centered. Of course, a new abutment and crown will also need to be fabricated to fit the new implant.